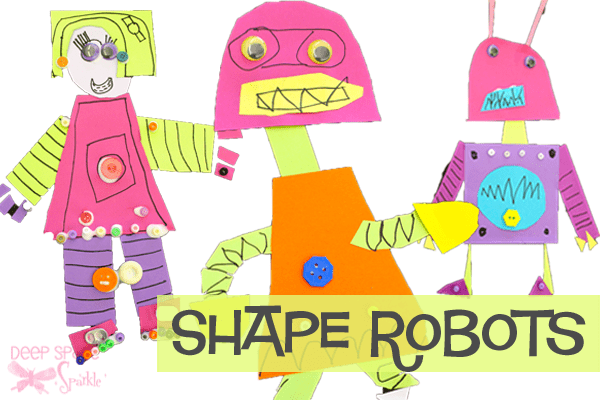 An excellent back-to-school project for Kinders, these Shape Robots offer a look into how well a child can cut and paste, identify shapes and apply a little whimsy to their artwork. 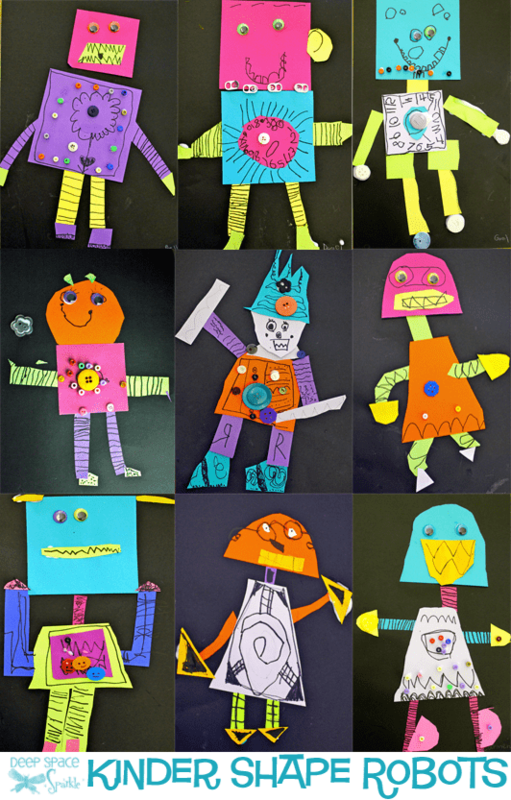 Starting with a tray of colored paper, children create a head, body and appendages for their robot. 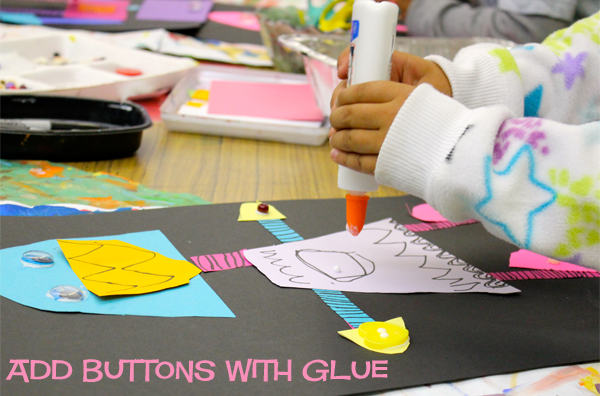 Using plastic tubs in various sizes helps little hands master a circle by tracing and cutting. You can eliminate the plastic cups if you are doing this project with older children. Starting with the head, children decide on a shape and create one. Add a body next and then the arms and legs. I ask the children to leave a space between the head and body in case they want to add a neck. 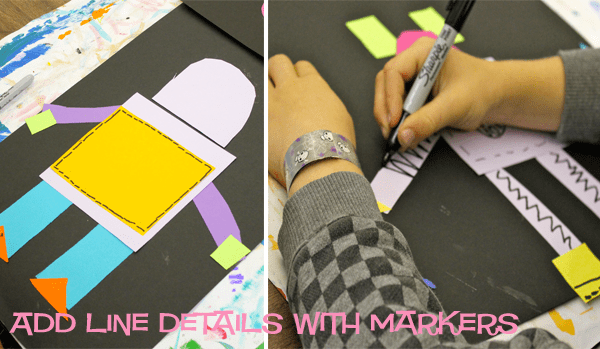 Using a black marker, the children can add details and definition to their robots. This is a good opportunity to talk about line and patterns. 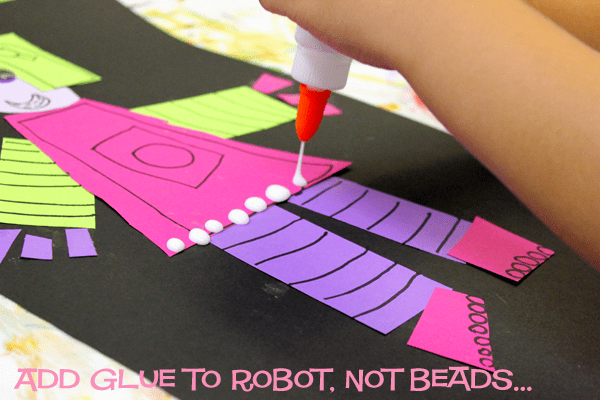 When its time to add the details, instruct the children to drop the glue onto the robot instead of trying to place a drop of glue onto a tiny bead. Much easier for little fingers! Wow!!! I recently decided to home school my children. One of my son curriculum’s did not come with an art book. Instead of buying one, I will look at your site. I hope to buy some of your books for the rest of the year. Your projects yield amazing results!!!! Thank you, thank you, thank you for sharing so many great projects! I am a homeschool mom who teaches art in several homeschool groups and co-ops. I have used many of your ideas in the past few years and love them all. You have saved me so much time with your great directions and photos. This means we get to do more projects because of the saved time! My own and other kids love every single one we have done. Thank you so much for sharing your art lessons. It is of been a gr8 help. keep going. There is no happiness than the happiness you get when you see the children’s art work. This is wonderful idea! I did it with my first graders when were were studying lines and shapes. Thank you!